Home Blessed Pedro Calungsod Canonization church Holy Life Story of Saint Pedro Calungsod Pedro Calungsod Philippine History saint Saint Pedro Calonsor. Filipino Saint Saint Pedro Calungsod The Martyrdom of Saint Pedro Calungsod! 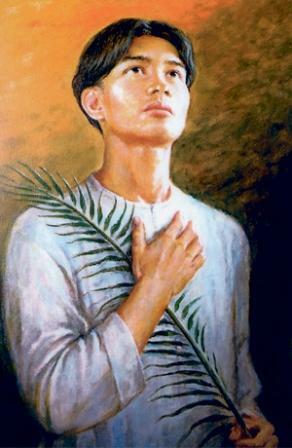 Right now, October 21, 2012, the canonization of the second Filipino saint, the Blessed Pedro Calungsod is taking place in the holy city of Vatican. After San Lorenzo Ruiz, here comes another Filipino saint who showed martyrdom in the name of faith. But, who is actually Pedro Calungsod. Do you know him as well as his life story? Why he is now hailed as the second Filipino saint?! Pedro Calungsod or Pedro Calonsor (his surname spelled 'Calonsor' in Spanish records) was born in Cebu on 1654 and April 2, 1672 at the age of 17. 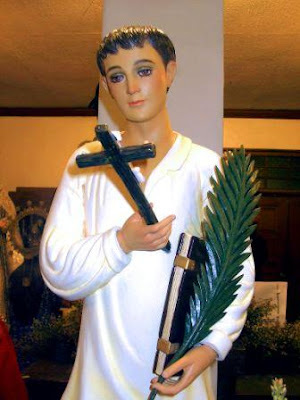 Just like San Lorenzo Ruiz, our first Filipino saint, Pedro also suffered religious persecution and martyrdom in Guam for their missionary work in 1672. A Chinese named Choco, a criminal from Manila who was exiled in Guam began spreading rumours that the baptismal water used by missionaries was poisonous. As some sickly Chamorro infants who were baptized eventually died, many believed the story and held the missionaries responsible. Choco was readily supported by the macanjas (medicine men) and the urritaos (young males) who despised the missionaries. In their search for a runaway companion named Esteban, Calungsod and San Vitores came to the village of Tumon, Guam on 2 April 1672. There they learnt that the wife of the village chief Matapang gave birth to a daughter, and they immediately went to baptise the child. Influenced by the calumnies of Choco, the chief strongly opposed; to give Mata'pang some time to calm down, the missionaries gathered the children and some adults of the village at the nearby shore and started chanting with them the tenets of the Catholic religion. They invited Mata'pang to join them, but he shouted back that he was angry with God and was fed up with Christian teachings. Determined to kill the missionaries, Mata'pang went away and tried to enlist another villager, named Hirao, who was not a Christian. Hirao initially refused, mindful of the missionaries' kindness towards the natives, but when Mata'pang branded him a coward, he became piqued and capitulated. Meanwhile, during that brief absence of Mata'pang from his hut, San Vitores and Calungsod baptised the baby girl, with the consent of her Christian mother. When Mata'pang learnt of his daughter's baptism, he became even more furious. He violently hurled spears first at Pedro, who was able to dodge the spears. Witnesses claim that Calungsod could have escaped the attack, but did not want to leave San Vitores alone. Those who knew Calungsod personally meanwhile believed that he could have defeated the aggressors with weapons; San Vitores however banned his companions to carry arms. Calungsod was hit in the chest by a spear and he fell to the ground, then Hirao immediately charged towards him and finished him off with machete blow to the head. San Vitores absolved Calungsod before he too was killed. Mata'pang took San Vitores' crucifix and pounded it with a stone whilst blaspheming God. Both assassins then denuded the corpses of Calungsod and San Vitroes, tied large stones to their feet, brought them out to sea on their proas and threw them into the water. The Catholic Church considers Calungsod's martyrdom as committed In Odium Fidei ('In Hatred of the Faith'), referring to the religious persecution endured by the person in evangelisation. Different TV shows will also pay tribute to San Pedro Calungsod. ABS-CBN tonight will air their documentary TV program sharing the life and times of this second Pinoy saint. GMA-7 on the other hand via their GMA News Channel 11 will air a docu-drama of San Pedro Calungsod wherein the hunk actor Rocco Nacino portrays the character of Pedro Calungsod. Aside from TV specials, different stage plays were already shown portraying the character of this blessed young man.